Inside the Timanfaya national park you can see a wide variety of geological formations related to the natural volcanic environment and a great biological diversity with 180 distinct plant species. It’s a habitat in which human presence has been negligible, apart from a laboratory which was set up to study the processes involved in the biological colonisation of the area. Just 12km from the Casa Rural los Ajaches you’ll find these extraordinary areas of natural beauty: La Laguna de los Ciclos, situated in the centre of the crater of the Montaña del Golfo, Los Hervideros and the salt pans of Janubio. 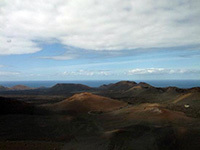 El Golfo is one of the rare examples of result of hydro-vulcanism – volcanic activity near the coast. In the volcano’s crater you will find the ‘Laguna de los Ciclos’, a bright green lake, whose colour is produced by the concentration of Ruppia Maritima – a species of aquatic plant. Los Hervideros is another interesting place to visit – the name can be translated as ‘boiling water’, and aptly describes the sea as the waves crash into coastal caves formed during volcanic eruptions. 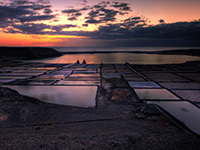 Las Salinas (salt pans) del Janubio is an area where salt is still harvested from the sea in the traditional manner, by slow evaporation of the water in a series walled pools. The area became a natural bay after the 1730-1736 volcanic activity and a sandbar was left, creating a partial lagoon. The César Manrique Foundation in Tahiche will give you an insight into the importance this famous local artist who was responsible for the creation of many of the tourist sites on the Island, and was dedicated to its conservation and care. The Foundation is located in the late artist’s house – which is partly comprised of a series of interconnected lava bubbles. 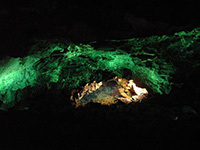 Los Jameos del Agua and ‘Green’s Cave’ are located inside a volcanic tunnel (one of the longest in the world at 6km) created by the eruption of the Volcán de la Corona. Situated on top of the Risco de Famara cliffs, the Mirador del Río is one of the most interesting of César Manrique’s creations, offering a stunning view to the island of La Graciosa. Followers of the Portuguese Nobel laureate can visit the library of the famous writer and his home in Lanzarote, where he lived for the final 18 years of his life.